After the success of our first guest catfish of the month (we received very positive feedback about it) we've produced another one! It is introduced by guest aquarist Kathy Jinkings, a prolific writer in the aquatic press, and devoted fan of all things bristlenose. Kathy has also written the world's only book on these fish, you can find a review here. Anyone dazzed by the flashing ranks of tetras and guppies in their local aquarium shop may well wonder why anyone would want to give tank space to an ugly fish that hides all the time. The truth of the matter only becomes apparent once you've given a home to a bristlenose catfish or two. Far from being boring and ugly, bristlenoses have a charm all of their own, and once in residence will quickly find a place in the heart of the most cynical fish keeper. While a wide variety of fish are sold as 'algae-eaters', few are as amazingly efficient at the task as bristlenoses. I discovered this early in my fishkeeping days, when I was reluctantly talked into what I considered to be an extremely overpriced pair of unattractive fish. Since I couldn't see any of my fish through a rampant growth of thick green algae, I reasoned that it didn't actually matter much what they looked like. The two tiny fry moved in, and within a month were not only considerably bigger, but were entirely visible - the algae had gone for good. Since that time I have learned a great deal about water management, and algae clearance is no longer a constant battle, but the bristlenoses are still in residence. Once the glass was clear, the two soon came to recognize me as the bringer of dinner, and going anywhere near the tank brought the fish plunging to the front of the tank and looking hungry. A diet of sinking catfish pellets, cucumber, lettuce, courgette and the occasional squirming mass of bloodworm resulted in a fully mature pair of bristlenoses at the end of the first year, when they proudly produced their first batch of bright orange eggs after much energetic chasing around the tank. This first pair was the precursor of many other bristlenoses, which have had a far easier time of it. The first pair determinedly grew and prospered through a variety of 'beginner's crises' without turning a bristle. Bristlenoses are hardy and tolerant fish. In spite of coming from the superclean, soft, and highly oxygenated rivers of South America, they will fit happily into hard or soft water tanks, and many species will spawn regardless. Indeed, bristlenoses have been known and spawned in the hobby for a long time, well before such luxuries as heater-stats, power filters and water test kits! The best crevices for potential spawning sites are long narrow ones, and plastic or bamboo pipes can also be used to provide shelters (which will eventually become spawning sites). The male will find a crevice to call home quickly, and thereafter will usually be found there. In contrast the female is more nomadic, and does not set up home in a specific spot. Unfortunately bristlenoses are not all that bright when judging the width of a hole, and care should be taken to ensure the provided decor is free of hazards. The strong armour plating restricts flexibility, and they are unable to squeeze their bodies through if the holes are the wrong shape. I learned my lesson in this regard while trying to extricate a male bristlenose from a plant pot; he managed to get his head through the hole at the base, and could then go neither forward nor backward. After an entertaining half hour armed with a large pat of butter and a chisel, during which he complained loudly and plaintively with piercing squeaks, I resolved to vet all the tank decoration much more carefully! Although often just referred to in aquarium shops as 'bristlenose catfish', there are actually over fifty species. Many of these can only be distinguished from one another by close examination, so if you want a breeding pair it is safest to buy two at the same time. Although wild-caught fish with a full complement of bristles are always tempting, they can bring disease from their native rivers and are often stressed after their travels. Such fish rarely become as tame as those bought as little juveniles (about an inch long). Unless you are collecting bristlenoses and particularly want a special species, the best buy is four or five of the little 'tank bred' fish (usually Ancistrus cirrhosus). These are likely to grow up into confident fish that are seen out and about in the tank, and will spawn successfully in your water. If you are raising a group of juveniles grows, there may well be more than one male. Male bristlenoses are reputed to be aggressive towards one another, locking-out the spines at the base of the operculum (gill plate) and thorny pectoral fins to inflict serious wounds. In actual practice, most of these experiments appear to have involved placing two males who had already spawned in close proximity. In these circumstances mayhem is guaranteed. In normal circumstances, they are sociable, provided there is enough tank room for a male to choose a secluded crevice away, if he wants to. This is the subtle difference between choosing to have a flat mate, and being locked up in a prison cell with someone. Provided there is enough room for the fish to avoid one another if they want to, two or more pairs can live together amicably. A four foot tank is sufficient for two or three pairs, but a thirty inch tank can only house one pair. Anything smaller than this should not be considered as a permanent home. The bristlenose catfish is a hard working algae cleaner, tolerant, peaceful, and is happy to demonstrate its spawning and parental care in the aquarium. Not only that, but most aquarium shops can sell you one - try a pair, and see for yourself the charms of these delightful catfish." The common Bristlenose is commonly captive bred appears impossible to identify to species primarily due to a lack of original locality information but also because tens of undescribed congeners exist. It is not assigned to species here for that reason. It is sometimes thought to be a hybrid, however it is not easy to determine if it is so or not. Several man made variants exist: piebald, albino and long-fin (veiltail) varieties have been bred in a captivity. General Remarks This species was known as Ancistrus sp(3) in the Cat-eLog from February 1997 until August 2008, it will likely still commonly be referred to under this name for some time and even its current designation is a little tentative. For these reasons we've left "sp(3)" as a common name. Several colour forms exist as well a long fin strain. The super-red form was first line-bred from the calico form of the common bristlenose in Germany. As is the way with the common bristlenose, they are pretty fertile and as soon as the pure strain got introduced into the market, it quickly spread across Europe and over the Atlantic. A long-finned variety was also line-bred from them relatively soon after that. There is some variation in the quality of the strain, a good strain produces 100% all-red offspring, less-than-optimal breeding stock (even if they are all-red) can produce a fair amount of offspring with some residual black markings. 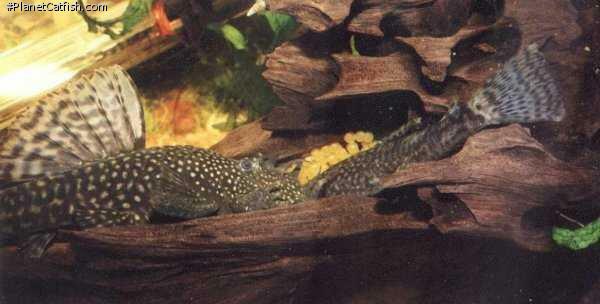 Feeding It is thought that elements in bogwood, particularly lignin, may form an essential part of Bristlenose diet. Certainly they have the immensely long guts common to vegetarians, and although they fall avidly on the occasional meal of live food or prawns, the bulk of their diet must be composed of vegetable matter. If a high protein diet is fed constantly, then they will become prone to stomach disorders. Vegetable roughage keeps the gut in working order, and bogwood is a valuable addition to this. Fry will feed from free-swimming on the same diet as parents. It may help to blanch vegetables when feeding young fry, as it helps them rasp off the food stuff. Furniture In the aquarium they prefer a strong water current with lots of oxygen, and require plenty of hiding places. Bogwood is ideal for this, as it is not only attractive to look at and provides plenty of shelter. Although they are vegetarian, they do not feed on water plants either naturally or in the aquarium, and your treasured collection of cryptocorynes will not only remain uneaten, but the Bristlenose will carefully and gently graze each leaf, removing any covering of algae that may form. Compatibility They are gentle and unassuming fish, and can be kept in community tanks with the most timid of inhabitants. Even tiny fry will be left unharmed once free-swimming. Suggested Tankmates All community fish, small to medium sized cichlids. Breeding See catfish of the month article. Breeding Reports There are 67 breeding reports, read them all here. There are 1139 registered keepers, view all "my cats" data. There are 66 records of this fish being seen, view them all.